Mario Strikers Charged was originally released for the Wii on July 30, 2007 with a MSRP of $49.99. The game was developed by Next Level Games, and published by Nintendo. Mario Strikers Charged is a sequel of sorts to Super Mario Strikers which was released on the GameCube, and was also developed by Next Level Games. The game received an "Everyone 10+" rating from the ESRB, with "Crude Humor, Mild Cartoon Violence" listed as content for gamers/parents to be aware of. On Sunday August 28, 2011, Mario Strikers Charged joined the Nintendo Selects lineup of games, and now has a MSRP of just $19.99. How many hours have Wii owners played soccer(or football!) with Mario and friends since Mario Strikers Charged released just over 4 years ago? Let's take a look! you can find the details for the contest/giveaway at this LINK, HERE! 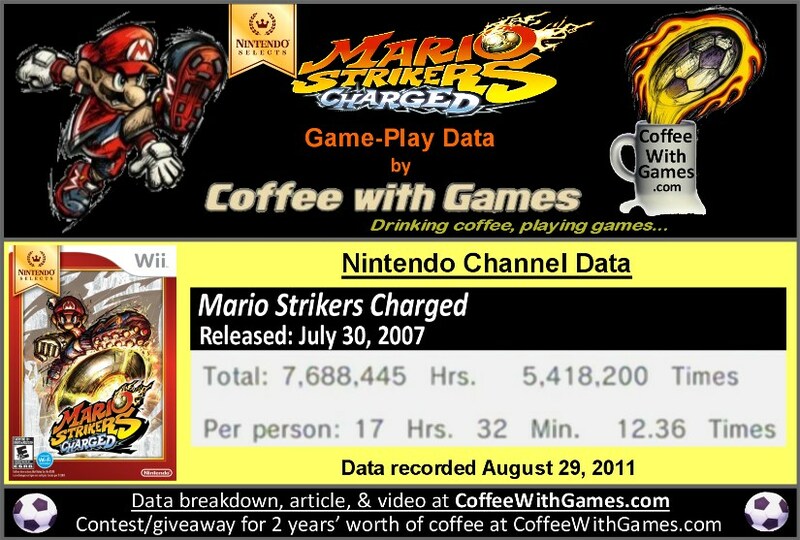 Mario Strikers Charged has about 438,365 Wii owners that have reported game-play data through the Wii's Nintendo Channel, with 1,491 days possibly reported. 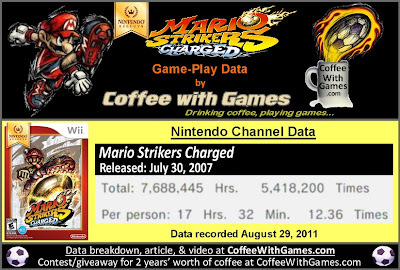 Mario Strikers Charged has 7,688,455 Total Hours of game-play reported, with an average play-time of 17 Hours 32 Minutes "Per person", or console, reporting data. The game's average play-time is 1 Hour 25 Minutes per day/session reported. The original version of Mario Strikers Charged has an Amazon.com sale rank of #2,001, and it is listed for $34.95. Nintendo Selects: Mario Strikers Charged's Amazon.com sale rank is #755, and is currently selling for $19.99. Mario Strikers Charged's "professional" review score average is 79.75%, based on 58 reviews on GameRankings.com. The game has about a 4 out of 5 Stars rating on Amazon.com, based on 59 customer reviews between both versions of the game. Mario Strikers Charged's customer review score average is 84.40%, when the customer reviews are converted to a 100% review scale. The length of a professional soccer game is 90 minutes of play-time, split into two halves; 45 minutes each half. Based off this, Wii owners have played the equivalent of 5,125,630 professional soccer games with the reported game-play hours from Mario Strikers Charged. If you count the 15 minute half-time most soccer games have, or 105 total match minutes, Wii owners have played about 4,393,397 full professional soccer games. While I do not own Mario Strikers Charged, I have played it. A few years ago, Mrs. Coffee and I had some friends come visit us, and I rented the game for a couple of days. We played the game's local multi-player, as well as online multi-player. If it were not for running into a few glitchers in the online, we probably would have enjoyed the game's online more than we did at the time. When I played Mario Strikers Charged, the game-play formula reminded me of the NHL Hitz games, so I looked up information about the game. Next Level Games' first game they developed and had published was NHL Hitz Pro, which was released in 2003 for the GameCube, PlayStation 2, and Xbox. While the reported game-play data for Mario Strikers Charged is higher than most Wii games, I think it's interesting that this game has "Mario" in its title and online multiplayer, but it has already been passed by another game that released less than a year ago, with "Total Hours" reported as of 2 weeks ago. If you have only been following my site for the last year or so, you may have missed my post from January 2010 titled, "Nintendo Stops Shipping and Producing more Wii Games: Wario Land: Shake It!, Battalion Wars 2, and Mario Strikers Charged", which showed how Nintendo had stopped producing/shipping Mario Strikers Charged and two other games. Why Nintendo waited so long to bring out the Nintendo Selects titles still baffles me, but I am really glad to see Nintendo continuing to add Wii games to their Nintendo Selects lineup, and I hope that it will continue with many more games in the future. Over the weekend that I rented Mario Strikers Charged, we played it a good bit as I stated above, and you can see in the image below how much we played it over about 4 days before I returned it. Do any of you own Mario Strikers Charged and play it regularly? If you own it, or have played it, would you recommend it to other Wii owners now? If you don't own the game, does its new MSRP of just $19.99 make you more likely to purchase it? Good comparison to NHL Hitz actually - and we did have this one for quite awhile. I think it mostly depends on if you like the Nintendo brand of sports titles. They usually lack the depth of a more sim-oriented one like Fifa or Madden, but the gameplay is definitely more inviting to families. This is actually on my to-review list right now. We don't play it anymore, we traded it in about a month or so ago (good timing based on the price drop) - but it's one my kids seemed to enjoy - especially my oldest, who doesn't really play many video games. Yea, I really enjoyed the first two NHL Hitz games last gen, and when I played Mario Strikers Charged the similarities were very obvious. I will say the "goalie" view in Mario Strikers Charged had to be one of my favorite game-play elements in the game, and I don't know of any other soccer or hockey game that has it implemented as it is in MSC. Thanks for the comment/feedback, and I'll be watching for the review!